While you can purchase pre-made pie dough and frozen pie shells at your local grocery, there is one major problem with them: They are not sweet crusts. Sweet crusts are needed for many wonderful dessert recipes, including a few of my favorite tarts and pies--the recipes for which I'll be posting here in the near future. And that's why I'm starting with this basic post on how to make a classic French pâte sucrée or "sweet dough." 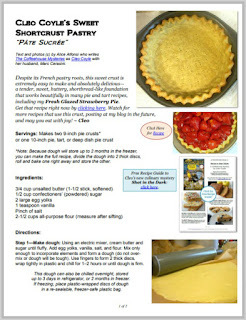 To download my Sweet Pastry Crust recipe now in a free PDF, click here. 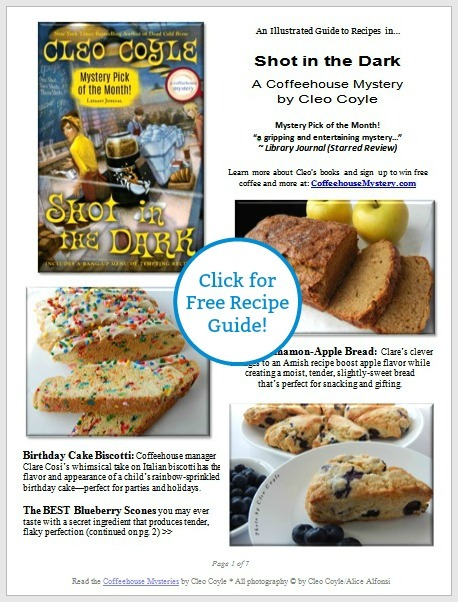 To keep reading this blog post, click here or on the Read More link below, and may you bake with joy! In other words, perfection is overrated. The very crust that looks so beautiful in my photos suffered several small tears as I transferred it from parchment paper to pan. To make it whole again, I patched it back together. And that's the beauty of pie crust. Easily fixable. A relief when so many other things in life--bones, hearts, feelings--are not so quick to mend. My point? Don't ever be ashamed of imperfection, especially with this recipe. Because this sweet shortcrust pastry is a classic complement to some really wonderful pie and tart fillings, and you're sure to be happy you tried it whether it turns out perfectly or not. Because, the truth is, perfection is pure illusion...and even God admires scars. Despite its French pastry roots, this sweet crust is extremely easy to make and absolutely delicious—a tender, sweet, buttery, shortbread-like foundation that works beautifully in many pie and tart recipes. Because this dough stores up to 2 months in the freezer, consider making the full recipe, divide the dough into 2 thick discs, roll and bake one right away and simply store the other until you're ready to bake again. Step 1—Make dough: Using an electric mixer, cream butter and sugar until fluffy. Add egg yolks, vanilla, salt, and flour. Mix only enough to incorporate elements and form a dough (do not over-mix or dough will be tough). Use fingers to form 2 thick discs, wrap tightly in plastic and chill for 1–2 hours or until dough is firm. up to 3 days in refrigerator, or 2 months in freezer. in a re-sealable, freezer-safe plastic bag. 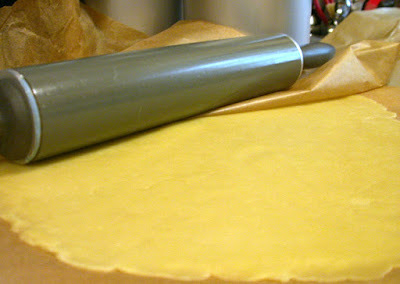 Step 2—Roll dough: When you remove the dough from the fridge, it will be firm to very hard. Allow it to warm until pliable. Roll out dough to about 1/8-inch in thickness. To avoid using excess flour while rolling (which can toughen crust), simply roll the dough between 2 sheets of parchment paper—only the smallest amount of flour will be needed. The dough may stick to the paper as you roll it out, but you can slide the whole thing onto a baking sheet and transfer it to the fridge to chill for 10 to 15 minutes. This will firm up the dough again and the paper will easily peel away. 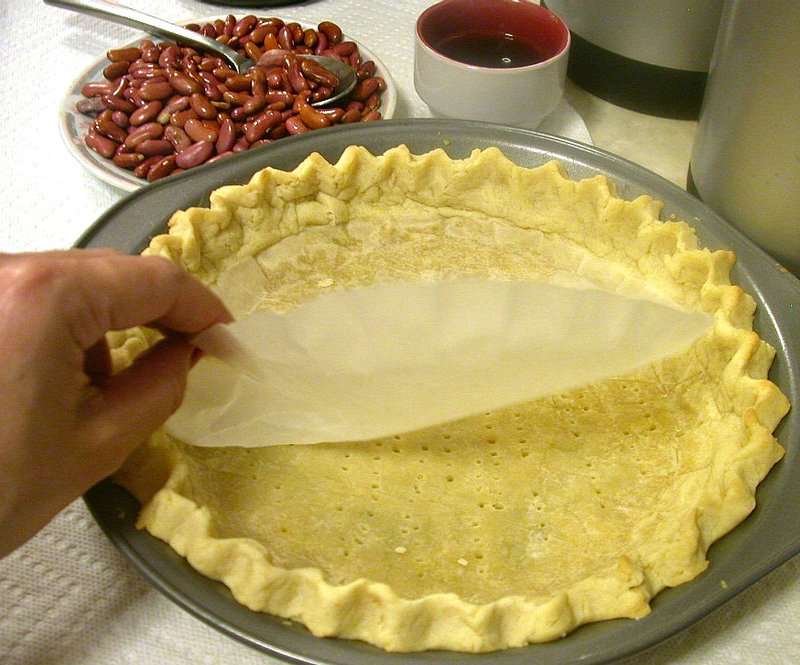 Step 3—Flute, prick, chill: Transfer your rolled-out dough to your pie or tart pan. Trim to fit. Patch torn areas with extra dough, and create fluted edge by pinching dough between fingers. 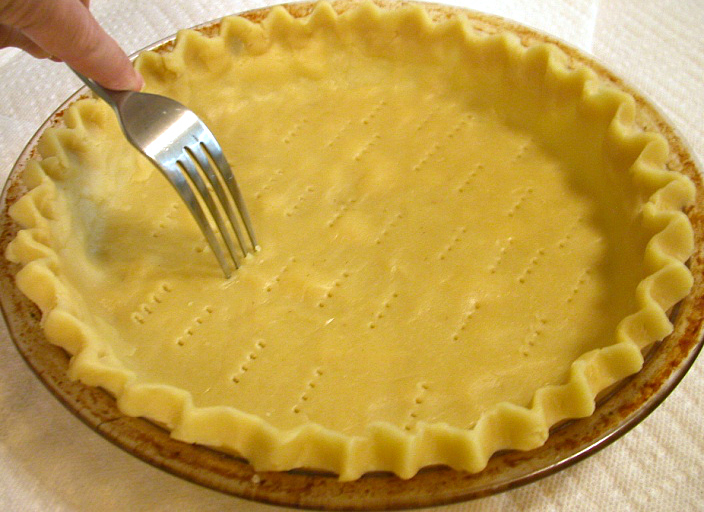 Use a fork to prick bottom of unbaked shell—this prevents bubbling. Now chill the unbaked crust for 15 minutes in the refrigerator. COLD pastry in a HOT oven is what creates flaky layers so be patient and chill. 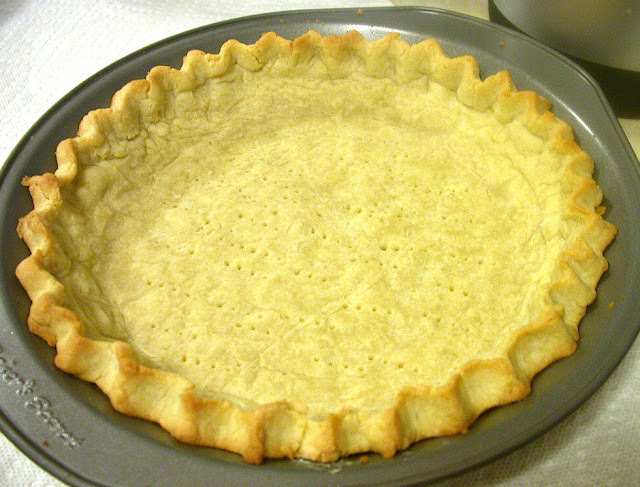 Step 4–Bake: Preheat oven to 375° F. To “blind” bake an empty crust, you must weight it to keep it from shrinking. 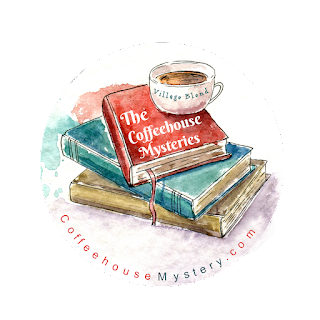 Here’s a fun “coffeehouse” trick. 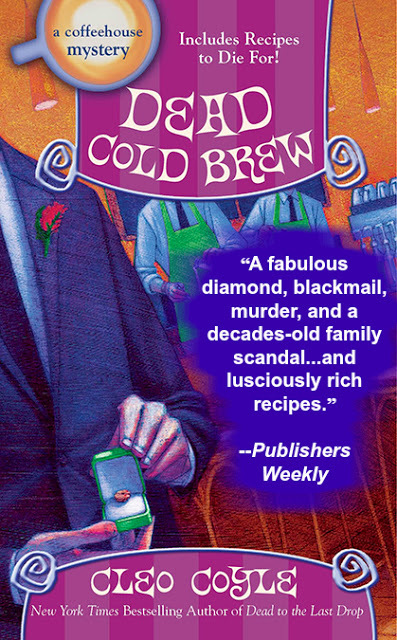 Place a flat-bottomed paper coffee filter on the bottom of the uncooked crust and weight it with 2 cups of dried kidney beans (or use pie weights). If you don’t have a flat-bottomed paper coffee filter, simply trim a piece of parchment paper to fit your pan. In a pinch, you can even use aluminum foil, but the paper coffee filter or parchment paper will give you better results. 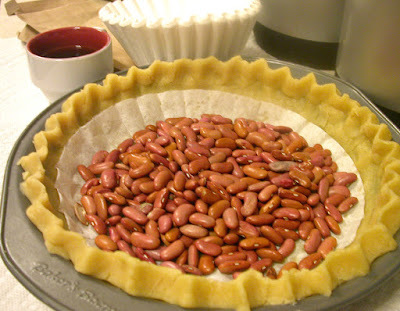 Bake weighted crust for 10 minutes at 375° F. Remove from oven and use a spoon to gently scoop out the beans. 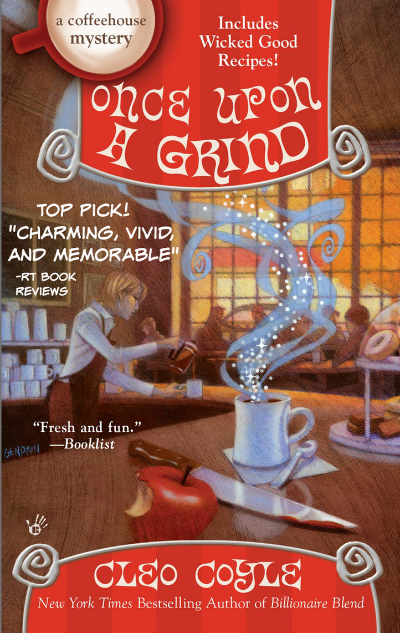 Then peel back and remove the coffee filter. Return the crust to the oven for another 5–8 minutes or until lightly browned. Cool before filling and serving. 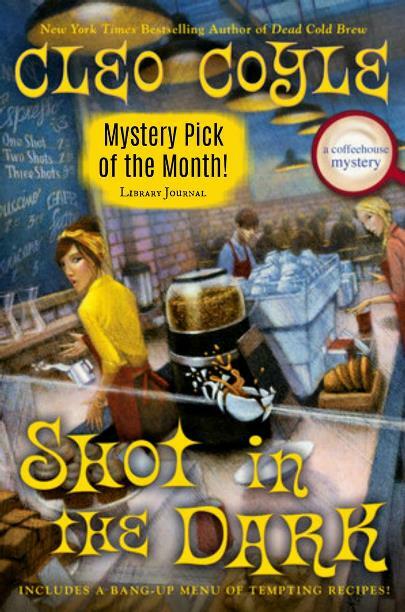 I don't know why some cookbooks tell you to roll dough out between pieces of wax paper. I did this on their recommendation, cursing my way to the ultimate solution: Parchment Paper. 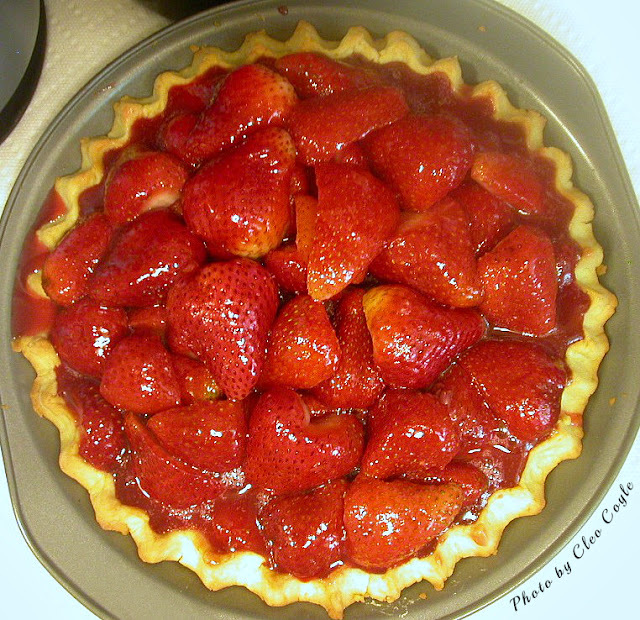 Wax paper only works if you use flour to prevent sticking--and excess flour will toughen your crust. So take my advice and plop your disc of dough onto a sheet of parchment paper, drop another piece of parchment paper on top, and roll the dough out. Then slip the whole thing onto a cookie sheet, place it in the fridge for a few minutes, and the dough will harden up again. 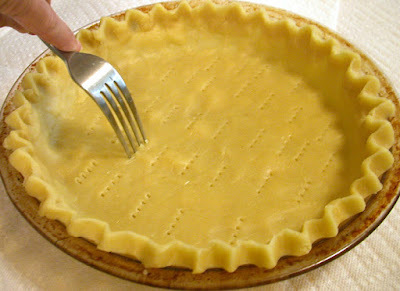 Now you can easily peel away the top layer of parchment paper and transfer the dough to a pie pan. Blind baking sounds like an extra step and a lot of trouble. It's not! It's incredibly easy, especially if you use this trick: buy flat-bottomed coffee filters. 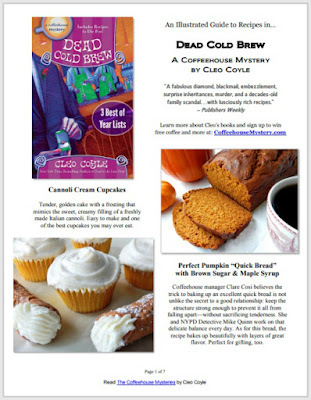 Simply drop a paper coffee filter onto the dough, spread 2 cups of dried kidney beans on top of the filter to weight it and bake...(see my recipe for final instructions). 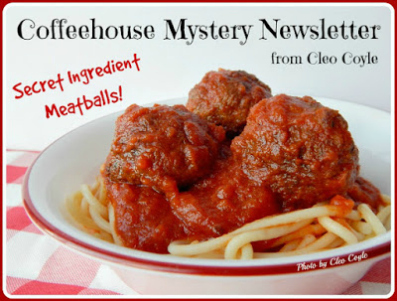 worked a coffee connection into this recipe, can you?! 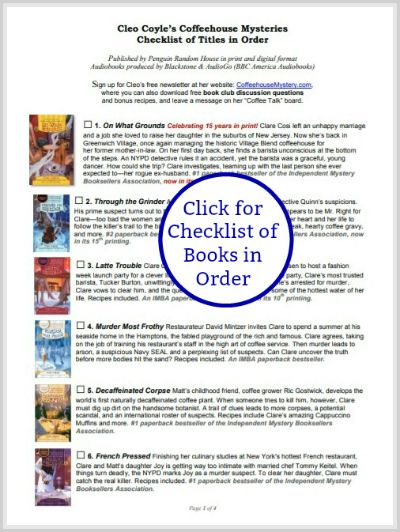 Eat, drink (and read) with joy!